King Solomon’s Mines was the first Hollywood production to be filmed in Africa since the disastrous Trader Horn in 1931. Trader Horn made a tidy profit at the box office, but the actual shooting was fraught with danger, disease, and even death. The leading lady, Edwina Booth, contracted a serious illness that forced her to retire from acting, and she sued MGM, who settled with her out of court. 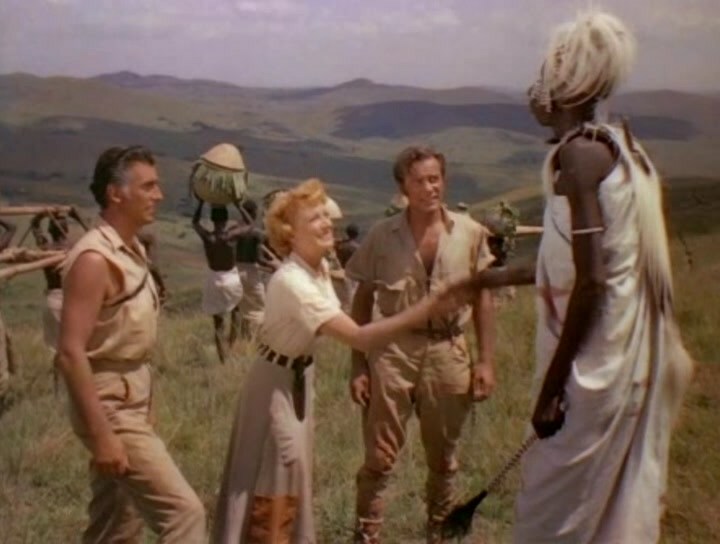 So MGM was naturally hesitant to mount another massive production shot on location in Africa, but King Solomon’s Mines was a gamble that paid off. Not only is it a beautifully shot, well-acted, and exciting film, it was a massive financial success, and was MGM’s most popular release of 1950. It’s been awhile since I’ve read H. Rider Haggard’s 1885 novel, King Solomon’s Mines, but this film version felt very different to me from its source material, and mostly in ways that I liked. The most obvious change from the novel is the gender switch of one of the main characters to allow for a female lead. In the novel, a safari leader named Allan Quatermain is hired by a British aristocrat, Sir Henry Curtis, who wishes to find his brother who went missing while searching for the mythical treasure of King Solomon in uncharted regions of southern Africa. The film version instead features a character named Elizabeth Curtis, whose husband is missing. She’s played by the red-haired Scottish actress Deborah Kerr. 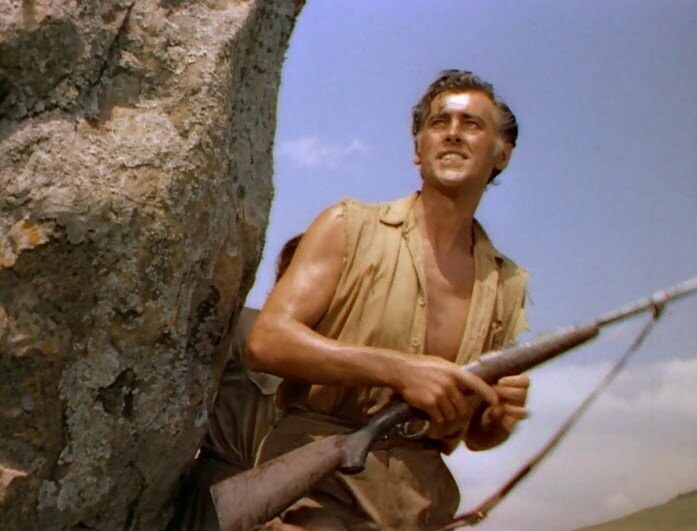 Allan Quatermain is played by the English actor Stewart Granger. The role was originally offered to Errol Flynn, but he balked at the rigorous location shooting and turned it down in favor of appearing in Kim (1950), an adaptation of the novel by Rudyard Kipling. That film was shot in India, but the actors didn’t have to rough it, and stayed in a resort, where presumably Flynn could continue drinking himself to death in comfortable surroundings. The gender switch is an obvious change, but it’s the overall tone of the film that I thought was the biggest shift from Haggard’s novel. The novel is a rousing Victorian adventure story, while the film is much more of a travelogue. In fact, one of the most common complaints about King Solomon’s Mines from modern viewers is that it’s “boring,” and has very little of the type of action they expect from an adventure story. Which version you prefer depends upon your personal taste, but I personally loved this film. After so many years of “Africa” in Hollywood films being depicted as a jungle set on a sound stage, seeing the actual landscapes of Uganda, Kenya, and the Congo was a revelation. This is a stunningly beautiful film, and Robert L. Surtees’s Oscar for best color cinematography was well-deserved. 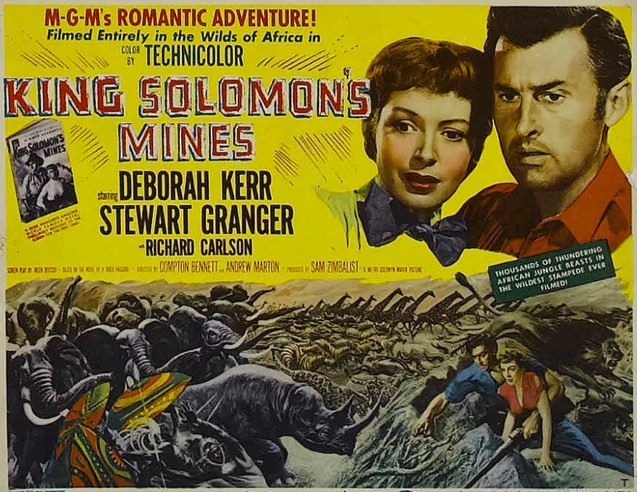 King Solomon’s Mines premiered on November 9, 1950, in New York, and went into wide release on November 24. 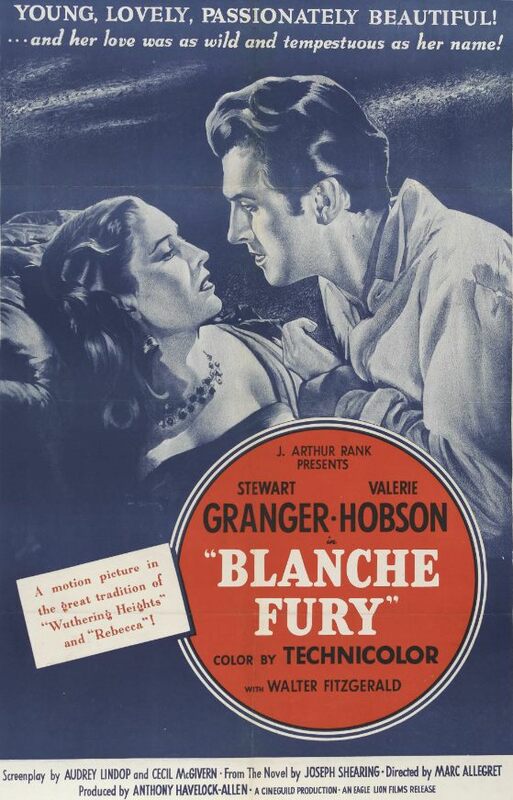 Posted in 1950, November 1950 and tagged 23rd Academy Awards, Andrew Marton, Compton Bennett, Deborah Kerr, H. Rider Haggard, Metro-Goldwyn-Mayer, Richard Carlson, Stewart Granger. Bookmark the permalink.